Iowa is the 30th most populous state in the United States with a population of 3 million people and is nicknamed The Hawkeye State. It is bordered by Wisconsin, Minnesota, Illinois, Missouri, Nebraska, and South Dakota. 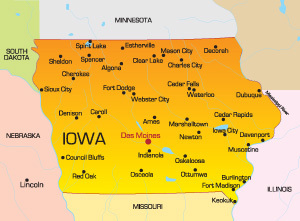 The capital city is Des Moines which has a population of 200,000 residents. The major highways that service the state are I-28, I-35, I-74, and I-80. Other modes of transportation include air travel to and from Des Moines International Airport and Quad City International Airport. Attractions in Iowa range from places like the Des Moines Arts Center to the Prairie Meadows Racetrack Casino in Altoona. Notable universities in Iowa are University of Iowa and Drake University.